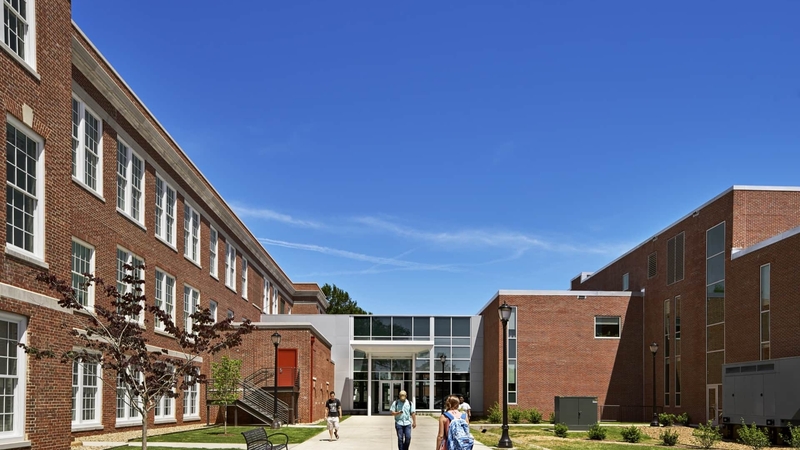 After the Chemistry and Biology departments moved to a new facility, TMPartners (in a Joint Venture with Hastings Associates Architects) designed the renovation of the Davis Science Building and Wiser-Patten Science Hall. This $20 million, 113,000 square foot renovation project prepared the vacated buildings to house the Physics, Geosciences, Anthropology, Forensics and General Applied Sciences departments. A new central entrance lobby was also added between the two buildings to allow circulation and collaboration between them. This project will provide the university with much needed academic space and state-of-the-art technology, allowing it to serve both students and faculty for years to come. Older science labs were renovated into new teaching labs accommodating flexibility for the future. Areas of the buildings were completely demolished to accommodate a new Academic Advising Center and faculty suite. New informal learning spaces and student lounges were integrated throughout the building. The project included new stair railings, lighting, security and technology systems, main electrical distribution system, windows, elevators, and improvements to the exterior brick facade. Restrooms were renovated for ADA compliance. Site improvements, including new walkways, courtyards, and landscaping.